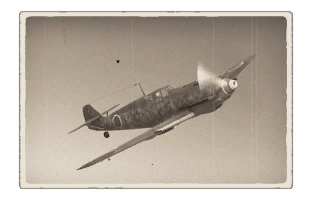 The ▅Bf 109 E-7 is a premium Rank II Japanese fighter with a battle rating of 3.0 (AB/RB) and 2.7 (SB). 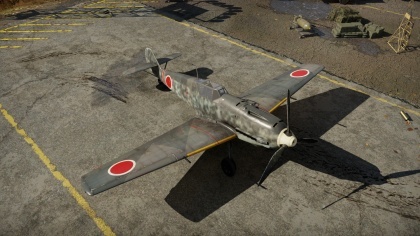 It has been in the game since the start of the Open Beta Test prior to Update 1.29 as the Bf 109 E-3; it was renamed to the Bf 109 E-7 in Update 1.65 "Way of the Samurai". While essentially the same plane as the E-3, the E-7 overcomes the inadequate MgFF for MgFF/M, featuring the fantastic minengeschoße. With two wing mounted MG FF/Ms with 60 rounds each, the plane has an even more deadly punch, attributed solely to the new installed HE-20 mm shell. Fighting in the E-7/U2 is essentially the same as with all E-frame 109s. Remaining a great energy fighter versus its historical opposition, the E-7 is somewhat troubled by the fact that it often faces mid-to-later war planes such as the P-47D. To engage these, make sure you have a clear energy advantage or, if attacked, fly defensively and attempt to bleed the enemies speed while pulling him down. The Bf 109 E-7 is often not regarded as a good turner, a reputation coming out of the fact that its main rival, the Spitfire, simply did it better. However, especially with combat flaps, the E-7 is a respectable turner able to out turn most planes that outperform it. Keep in mind though that one of the changes from E-3 to E-7 increased the frame's weight. Flat turning should only be reserved for extreme situations. 10 mm Steel plates behind the pilot. Just as the with the E-1, new players should adopt a hit and run tactic with the Bf 109s. While often called Boom & Zoom aircraft, the 109s are not dedicated Boom & Zoomers and many other aircraft such as the FW 190 do it much better. While it is true that a pure Boom and Zooming approach can be used in the 109s, limiting oneself to this undermines ones plane efficiency enormously. That said, the 109s does build up speed fast in a dive and they have a respectable zoom climb that ends in a strong sustained climb at ~270 km/h [optimal climbing speed 260 km/h - 280 km/h]. Doing so will often see the player with the maximum speed or altitude advantage he can have over his chosen target. A straight up bounce, with a short extend from the target and a slowly increasing climb leading into an Immelmann tends to work best for rookie pilots. Remember to check your six and surrounding during the climb and just before diving back on your target. With mounting experience on the side of the player, the energy fighting abilities of the Bf 109 E-7 come to the forefront. Fluid and speedy transitions between altitude and speed, together with well timed uses of flaps, throttle and maneuvers enable the Emil to quickly change the nature of the engagement in its favor. When firing at enemies, be aware that your 20 mm cannons only hold a 60 round drum magazine each. They empty quick and many a new pilot has seen himself on pitiful low ammunition even after his first attack run. Once you emptied your cannons, the E-7 will be hard-pressed to secure a kill. In your own interest, do not waste your cannons on ground targets and when firing at planes, fire in short, controlled and well aimed bursts. Luckily, the E-7 holds 1,000 rounds in each of its two MG 17s. Use these if you are inclined to spray and pray or are are about to engage ground targets. Weak low-velocity cannons compared to others; Hispano, Mg151. Although Imported, Japan decided to not pursue a license agreement with Germany over the Bf 109E. The Emil, (Nicknamed Mike) would stay in Japan until the end of the war. This page was last edited on 17 March 2019, at 19:57.